Have you seen an ad like this recently? Have you -- or anyone you know-- ever considered donating eggs? With all the ads that you see in the newspapers featuring smiling women, babies, and families, it is easy not to think about some of the serious risks and side effects of being an egg donor. 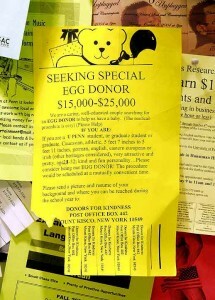 The amount of money that these ads offer to egg donors may be irresistible. But before you consider donating your eggs, for your own health and well-being, learn about the process and its risks. Let’s look at what is involved with egg donation. Egg donation is a drawn out process that requires numerous visits to the fertility clinic in order to undergo several clinical procedures. First, you will be given drugs to shut down your ovaries from their regular cycle. Then you will be given multiple injections of hormones to hyperstimulate your ovaries to produce around 12 - 30 eggs per cycle, rather the single egg which is naturally produced. At the end of that process, you will undergo minor surgery to extract these eggs. The drugs you would have to take and the procedure to extract the eggs are not without risks. You most likely will not be told that many of the drugs have not been approved for fertility treatment but are being used “off label,” meaning that they have not been tested by the FDA for this application. You should also know that there are a number of reported side effects associated with these drugs, both immediate and long-term. The short-term side effects are better known, but there are very few long term studies, so the long term risks are not well documented or understood. So what are the known side effects you might suffer from? Women who have taken the hormone injections have reported rashes, migraines, depression, abdominal pain, and hair loss; some have suffered from abnormal liver function. One of the most serious risks is ovarian hyperstimulation syndrome (OHSS). According to the American Society of Reproductive Medicine, mild forms of OHSS occur in 10-20% of cycles (some egg donors go through more than one cycle). Vomiting, nausea, diarrhea and abdominal distention are some of the effects of mild forms of OHSS. In the severe cases, ovarian stimulation has been associated with serious life threatening pulmonary conditions including the loss of limb and death. So think carefully about this and pass the word on – if you are considering selling your eggs be sure to get the right information, ask a lot of questions, and take your time to think carefully about what is at stake. This is a decision that will have many implications for the future – for you and your offspring.